Research in Motion, the BlackBerry maker that introduced mobile e-mail, is struggling. Global demand for smartphones is growing, but RIM’s market share is in decline. Investors and analysts are wondering if BlackBerry’s best days are behind it. It used to be that Mike Lazaridis and Jim Balsillie were welcomed as demigods of the tech sector at the annual shareholders meeting of their company, Canada’s Research in Motion. The co-CEOs of the BlackBerry maker that introduced mobile e-mail and turned it into a global phenomenon acquired hero status thanks to the meteoric rise of the company into a multinational corporation worth billions of dollars. For years, Lazaridis and Balsillie, the technical genius and the chief salesman at RIM, respectively, were above criticism. Together, they propelled BlackBerry into its position as an indispensible device for business and politics, overcoming initial skepticism about the security of sending e-mail through the ether. E-mail on the go became so indispensible and addictive that the BlackBerry, known for its distinctive keyboard, was nicknamed ‘CrackBerry’, after crack cocaine. Even U.S. President Barack Obama is a fan. And RIM’s rise as a stock market darling didn’t end there. In recent years, BlackBerry became a hit gadget among consumers as well. Like corporate executives, non-corporate users also became hooked on RIM’s ‘push e-mail’: messages that are delivered to the devices through the company’s network of servers, announced by a tone. BlackBerrys could barely be made fast enough; by now, there are 67 million users worldwide. Not bad for a start-up in the Canadian university town of Waterloo. 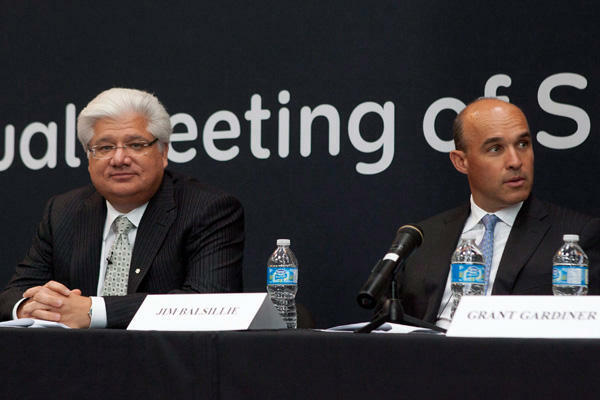 Mike Lazaridis and Jim Balsillie, co-CEOs of BlackBerry producer Research in Motion (CP photo). The euphoria of previous years was tempered considerably, however, when the two co-CEOs met with shareholders this week. Not because of the company’s financial results, as the executive duo can still boast impressive figures: last year, RIM had sales of nearly $20 billion, a ten-fold rise from $2 billion five years ago. Profit for the year came in at $3.4 billion. Rather, the sense of crisis at the AGM had to do with panic that has erupted about the future growth of the company. Suddenly investors are wondering if BlackBerry is past its prime. The mobile e-mail device has had to contend with increasing competition – especially from the trendier iPhone by Apple and cheaper smartphones running on Google’s Android operating system, such as devices by Samsung and Motorola. The negative sentiment is based on some bad signs – the first in RIM’s history. For instance, BlackBerry sales in the crucial North American market have stagnated in recent quarters, even though that market is itself growing rapidly. As a result, RIM is losing market share in North America to iPhone and Android smartphones at an alarming rate. BlackBerry had 50 per cent of the market in 2009; it has since been reduced to 17 per cent. “You’re letting Apple and Android eat your lunch,” one shareholder told RIM’s executives during the meeting. RIM sales are also under pressure. In the first quarter, revenue in the U.S. declined by 27 per cent compared to the same period last year. For the current fiscal year, the sales outlook has been revised to just over $21 billion – slight growth compared to last year, expected to be delivered primarily by growth in markets outside of North America. The big question on investors’ minds is whether that is true. Is the current unease just a bump on the road to further growth? Or is RIM, one of the most successful tech companies of the last decade, irrevocably on the wane? Critics compare RIM to Nokia, the Finnish handset maker that squandered its lead because of an inability to adapt to new market conditions. In their view, RIM is in a similar position: BlackBerry, the pioneer of mobile e-mail, is no longer able to keep up with current developments on the market for smartphones it helped create. The cause of the stagnation is the fact that RIM has failed to release any new BlackBerry devices during the past year. That has to do with the development of the new operating system to replace BlackBerry’s existing software platform. 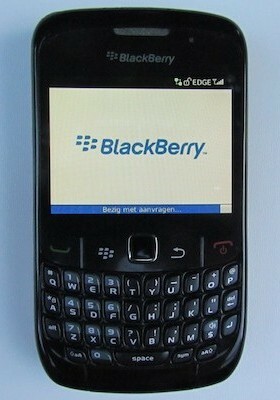 The new operating system, developed by software company QNX, a RIM acquisition, should make BlackBerry more versatile. It is already used in RIM’s tablet device, Playbook, and has been praised for its power and speed. The main reason RIM will not soon falter is the company’s strong financial position, he argues. It is reinforced by the fact that the company, unlike its competitors, makes considerable money from data traffic to its devices. As the only producer of handsets that also channels messages through its own data centers, RIM receives five dollars per user per month from telecom providers. The carriers like to work with BlackBerry because RIM compresses messages efficiently. Secondly, RIM has a strong base of business users. The company has a server presence in almost all companies of the Fortune 500 and beyond. Unlike consumers, corporate users are concerned about securing their mobile data traffic. That is BlackBerry’s core strength. Although there are business users who want to switch to iPhone, BlackBerry’s top-notch security is one major reason for companies to stick with RIM. Thirdly, RIM still has strong growth outside North America. In the past fiscal year, the company nearly doubled its sales in the rest of the world compared to the year before, to $10.7 billion. RIM is now dependent on regions other than North America for more than half its revenues. But Urlocker predicts that international markets will also level off, due to the rise of cheap devices running on Android. RIM’s problem is that the launch of the new BlackBerry has again been postponed, to 2012. So the pain continues. And although the new devices are expected to represent a leap forward, the competition is not sitting still in the meantime. Android and iPhone are also coming up with improved devices – and they have many more apps, mostly produced by external software developers. For iPhone, there are 525,000 apps, for Android 400,000. BlackBerry has 35,000 apps. The co-CEOs are frustrated by the negativity – and by growing calls for a change at RIM’s top. Shareholders have suggested changing the executive structure at the company. Balsillie and Lazaridis are serving as both co-CEOs and chairmen. Under pressure, they have agreed to set up a committee to assess the arrangement. Research in Motion is a bargain. Due to the sharp decline in RIM’s share price, the market value of the BlackBerry maker has declined from a peak of about $80 billion in 2008 to less than $15 billion today. This year alone, the company’s value has been halved. RIM’s market value now sits at five times annual earnings – a very low ratio. In the tech sector, the average market cap is 14 times earnings. Even a ratio of 10 is considered cheap. Under those circumstances, a takeover of RIM is a real possibility. The company wants to remain independent, and the two co-CEOs together own 10 per cent of the shares. Still, companies including Microsoft, Cisco, Oracle and IBM are mentioned in the financial press as potential buyers. So far, any advances have failed to materialize, perhaps because the timing is not good for some of the most obvious candidates. For instance, Microsoft, which might be a good fit because it is also strong in the corporate market, has formed an alliance with Finland’s Nokia. It also recently bought Skype. It is also possible that potential buyers are hesitant to make a hostile takeover bid because they have the same question as investors: will RIM return to growth, or is BlackBerry in an irreversible downward spiral?